According to Statcounter, usage of Windows 8.1 narrowly overtook Windows XP in November. That's partly due to record growth for Windows 8.1, which went from 9.31 percent in October to 10.95 percent last month. Windows XP usage also continued to plummet in its seventh full month without Microsoft support, dropping from 11.95 percent to 10.69 percent. Windows 8.1 is likely benefiting from the back-to-school season, as most new PCs are shipping with the operating system on board. Some Windows 8 users may still be getting around to the free upgrade as well, as Windows 8 usage dropped from 5.94 percent to 4.9 percent in November. But none of this activity appears to be harming Windows 7, whose usage increased for the second straight month. The five-year-old operating system now accounts for 50.34 percent of desktop usage, so it's the most popular desktop OS by far. Another metrics firm, Netmarketshare, also recorded share increases for both Windows 7 and Windows 8.1 last month, but still shows Windows XP ahead of the latest version by a narrow margin, despite plummeting usage for the ancient OS. 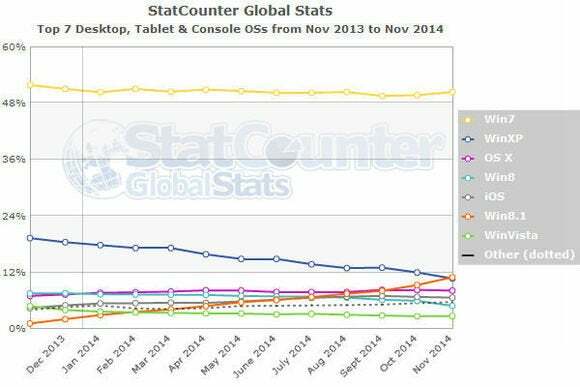 It seems likely that Windows 8.1 will land on top for both metrics firms within a month or two. The story behind the story: On some level, Microsoft is happy as long as it's selling licenses. (In its push to kill XP, the company has encouraged users to consider either Windows 7 or Windows 8.) But of course, Microsoft would prefer to get users onto the latest version, which is tied more deeply into services like OneDrive and Bing. Expect a major upgrade offensive against Windows 7 next year, with rumors of free or cheap consumer upgrades to the more desktop-friendly Windows 10.